Beautifully engraved certificate from the Stourbridge & Kidderminster Banking Company issued in 1834. This historic document has an ornate border with the company's name on top center. This item has the signatures of the Company’s Directors, James Foster, Esq., Robert Scott, and Joseph King. 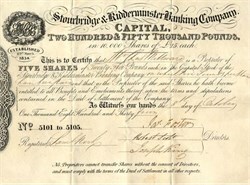 Stourbridge & Kidderminster Banking Company was established on 29 March 1834 by James Foster, a local iron manufacturer, in direct opposition to a private banking company, Bate & Robins. Foster held an account with this private bank and had been requested to reduce his overdraft. Consequently, with great indignation, he wheeled a barrow full of sovereigns into his bankers and poured them onto the floor. The slighted industrialist then proceeded to form his own bank with a group of friends - the Stourbridge & Kidderminster Banking Company. Foster was the first chairman and the new Joint Stock Bank, which soon took over the business of a private bank in Stratford-Upon-Avon (Tomes, Chattaway and Ford, established in 1810). Ford remained in Stratford as the branch manager. Joint stock banking in the West Midlands grew increasingly successful and the Stourbridge & Kidderminster benefited from the failure of two private banks in the area in 1851, gaining many customers from the bank closures.